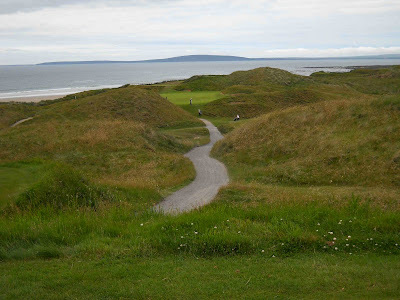 If you want to play and you're happy to join three golfers you don't know (including me) then leave a comment on this blog and be ABSOLUTELY SURE to check back at 1pm on April 3rd to see if your name has been picked. Alternatively, leave an email address, although it will be 'public' on this blog. Ballybunion Old's brilliant, long and terrifying par three 15th. Please note, it's a 3 hour drive from the M50/N7 Junction, but a journey well worth making if you want to play one of Ireland's best golf courses. Practice facilities are excellent too, and so is the breakfast if you fancy arriving early and lapping up the atmosphere. Irish golf doesn't get better than this. 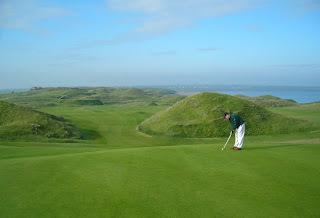 Ballybunion is on the top of my bucket list and I would love to give it a lash sooner than I would have had expected to. Put my name in the hat. I've heard great things, would love to play it. Yes please, Would love to. Haven't played there yet, but its on the list. The Ballybunion Golf Club is one of the favorite Practice course for the elite golfer who come from around the world here.